Hmm, LG look distinctly vulnerable..
3rd spot up for grabs some time in 2011? LG hasn't had a successful "super phone" of the likes that have boosted the fortunes of Motorola and Samsung; I believe they have a few models in the works. It remains to be seen if they can catch any market share with a highly specced, large screened handset of the Galaxy S type. OTOH, the whole "OMG the latest Android phone that goes to 11" phenomena may have limited shelf life-- there actually isn't all that much the manufacturers can do beyond bigger screens and faster CPUs, and at some point screen size is limited by the form factor. I don't think there's much of a market for 6" phones. Once you've achieved a certain level of saturation with must have geek phones, what little money to be made in the Android handset market may further contract, as the market as a whole shifts to cheap or free. That's already happened, to a certain extent, with not all that much differentiation between countless free or cheap on contract Android phones sharing shelf space with $200, heavily advertised hero phones (not to say Hero phones). Android, despite it's dawn-of-the-smart-phone early mover advantage (first credible competitor to the iPhone) is a commodity OS destined for commodity hardware. The glamour of the Droid X's and Galaxies and Heros is just an artifact of a new kind of device most people aren't familiar with and will fade; I expect Android to become the de facto "don't care it's just a phone" OS along the lines of the feature phone OSes that came before it. As such, it will command a lot of market share and make no to little money for anyone but Google, and Android handset manufacturers will compete with bling and dubious "features." Apple, OTOH, will be continuing to build a computing platform with ties across multiple devices and the desktop. RIM engineers at Happy Hour this evening..."we need more 'buttons,' hurry more, more buttons!" iPhones are more expensive in the UK than almost anywhere else - a long way from free. Reality of it is that iPhone ASP is well above $600 compared to the Blackberry's less than $300. The best thing my English father ever did for me was get us the hell away from England and to America via Canada! America is not perfect, obviously, but man oh man, talk about a land of opportunity! It's the best country in the world! (After Thailand) Chicks man...even the guys look like chicks...it's great! I live in the UK. The iPhone is offered for free here. You're forgetting that every "free" smartphone is tied to an expensive contract. Right, I'm reminded every month! $120 is tough pill to take! I'm really thinking of selling my iPhone for $350 and bailing on ATT and using my Verizon dumb phone....take the savings and get a WiFi iPad or the new MBA! Really hate bein raped by cell and cable companies every month! While your point is reasonable, I think Carniphage has a decent point, too. Your point applies to current sales (ie don't care what people used it for if they bought it) but Carniphage's would apply to future growth and share. If people are not using a current phone as a smartphone, it's likely going to be less sticky in the future. Those people in the next iteration might choose to get an iPhone, or a Droid or something else. No, his point is people are purchasing smartphones and not using them as smartphones, so those ones shouldn't be counted. I fall in the same situation, I own a smartphone, I use apps, I use the majority of functions on my phone, but I refuse to purchase a data plan because I think they are too expensive where I live, so according to him, and according to you, it shouldn't be counted. But thinking it may affect future choice, how can you know that? You can't. The products that are considered to be the equals of the iPhone/Android and WP7 devices are called N-series. These are typically sold with data-plans, and I suspect most people buy them to use them as real smartphones. Look at the purple line. Of course, you ignore the large number of other symbian smartphones Nokia sells which support all the functionality associated with "smartphones". And why do you only want to include ones with a "data-plan", that is only one function of these devices. I pay less now and get more (a lot more data) than I was paying five years ago, and that was more for less than I was paying fifteen years ago. I am earning more now than I was then, to me a free iPhone on a plan is not "expensive", expensive is a relative term. I wonder what these numbers would look like, if they removed devices, that are not ever used as smartphones. Nokia sell millions of devices which are theoretically capable of Email and web use. But are sold without data plans, and are never employed as smartphones by the users. If you want an idea, look at web use statistics. Apple blows away everyone else. They are larger then all the other players combined. As with all statistics though. Some players will never have a business model aligned to certain statistics. Apple is doing amazingly well in this chart despite the fact that these statistics highlight an area that Apple is weak in. They don't have a barebones phone to compete in this market. I continue to half-expect Apple to release an iPod phone that is not a smart phone. They could probably make it free after subsidy and would sell boatloads of them. I don't care about market share, units shipped, etc. SHOW ME THE MONEY (I.E., GROSS PROFITS)! Wonder what that tables looks like then. One Apple iPhone makes Apple more money than 10,000 Jitterbugs sold in Florida, so who cares about unit shipments. In terms of profit share (operating margin or EBIT - earnings before interest and taxes), Apple is the undisputed king. 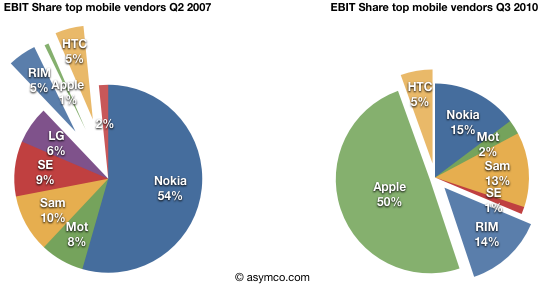 Apple's profit share is estimated to be a staggering 47% while only having 4.1% of the unit market share. 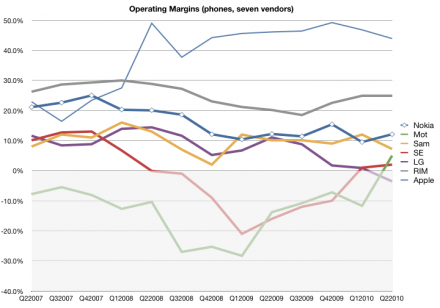 What would Apple's profit share be if their unit market share went up to even only 10%? It's pretty mind-boggling. All of Apple's competitors are literally fighting over scraps. I love that Apple has such a small (4.1%) over all market share. The growth potential is phenomenal. 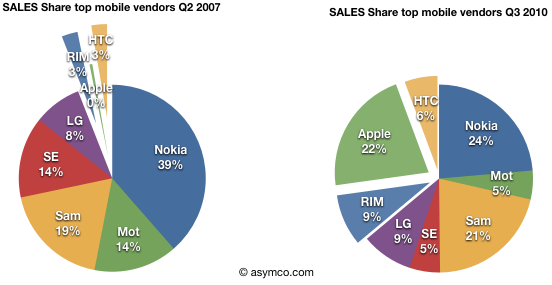 Courtesy of Horace Dediu at Aysmco (IMO, the best Apple business analysis site I've seen), here are pie charts of Apple's global cellphone market share against the competition for 3Q10 (July~September) compared to 3Q07 in units sold, sales revenue and profits. Apple is number four in units sold, number two in total revenue, and number one by a mile (and then some!) in profits. Talk about disruption of a huge established market in mere 3 years! I can see how this past quarter would be a surge for Apple since it?s the first full quarter of the new iPhone, but based on Apple and RiM?s previous Q3 to Q4 calendar quarters what percentage increase or decrease does each have YoY? That could be true if worldwide demand for iPhone 4 was being met. Right now, that's far from the case. Seasonality can be a factor but for calendar Q4 2010 I don't see RIM besting Apple. Just my prediction. We'll see what eventuates. Also, I'm not feeling the "buzz" in the media or elsewhere or at my local telco shops about anything latest and greatest from Blackberry. And it's already November. What killer lineup do they have at this stage? Admittedly I don't follow RIM products but like I said I'm not feeling the "heat" from them. ..... but based on Apple and RiM?s previous Q3 to Q4 calendar quarters what percentage increase or decrease does each have YoY? Thanks. 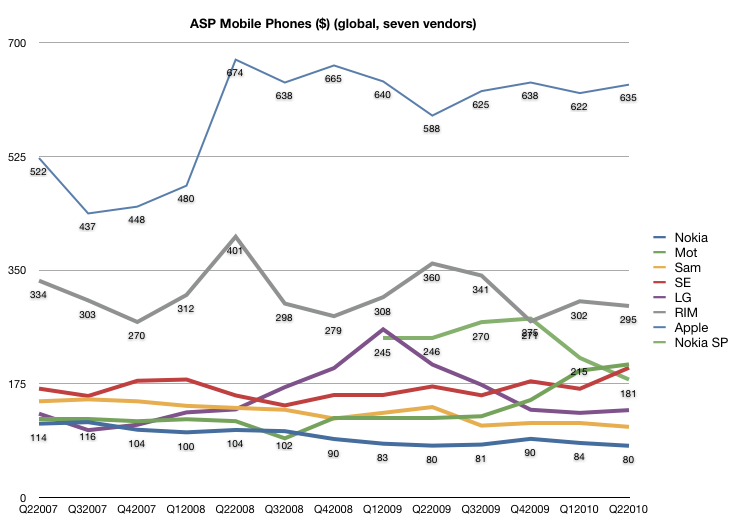 Based on those charts Jobs is probably right, RiM probably won?t catch up to Apple again. Needs to be considered alongside this? Look at RiM figuring out how to increase their margins without having any real modern competitors come into the picture. As I?ve always said, RiM is a well managed company. Hopefully they?ll be able to also get the engineering staff on board to push ahead, too.